Has become an indispensable tool to my studies. I have become a Tecarta addict. Never carry anything else to class anymore. The resources are almost unlimited as are the bible versions available from Tecarta. After eight years of using their resources I seldom if ever use anything other than my iPads. Can't say enough good things about this company! The Bible is right, but somebody’s wrong! The application works great, and always starts were you left off. I read KJV and use this app to help translate. May God give you an understanding, In Jesus name! The search engine is amazing, better than a Strong's concordance. This Bible is a very powerful tool to have in your pocket. I read it every day. So nice to have the Bible in my IPad, so much easier to use than the heavy book. Thank for making this available for such a low price. I use this NKJ study version Of the Bible along with the New Living Translation. They are the best study Bibles in print that I know of. This intuitive App has become even more user friendly over time. I use it daily and would highly recommend it. This is a great app I can use it on the go. This app is the best. I use it constantly for both my studies but also for teaching my Sunday school class. One of if not the best bible app I've used. I've been using this version for my main Bible apps for several years. I started with the KJV version and was so pleased I purchased the NKJV and the NLT versions. They are my "go to" Bible apps. You won't be disappointed using this Bible app. AWESOME app! Best Bible app ever! I love this Bible, I use it in church, I love to share the devotionals wit my friends on Facebook. 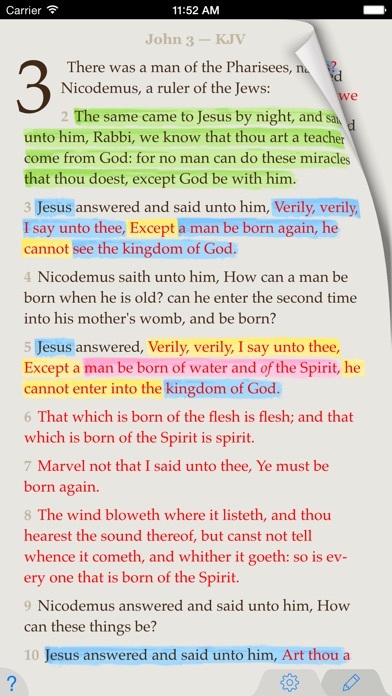 I like the highlighting feature for the scriptures. It's sic a nice Bible. Thank you so much for making it for my phone. I saw a sign on a church, that said do you keep your Bible as close as your cellphone? My answer was yes because it's in my phone. This is the best phone app I have downloaded. Works well for posting to Facebook and Twitter on my iPhone and Nook. Good search functions but could be improved by adding more book category filters like OT prophetic or NT epistles) as well as allowing wild card searches via asterisk. I highly recommend this app to anyone who travels but wants to have the Good Book with them without the bulk. This is the way to have the Bible, unadulterated, but yet still in modern form. What I like is the ability to highlight, share, comment and sync. All those elements are wrapped up in this one app, plus, certainly not to be forgotten, the various versions. I find it a blessing for the fact that I have to do Bible study in Spanish, and so I can have the split screen in English and Spanish, showing the scripture and allowing me to this expound and know how to approach a particular topic or text. It is a tremendous blessing to have. Always with you. When the opportunity presents itself.......your prepared! Isn't that what we're supposed to do?! I really enjoy having the Bible in my hand at all times. It's very easy to use and read wherever I am! I have it on my phone and iPad. Very reader friendly, easy to navigate to different chapters. I recommend this to anyone in need of a Bible on their tablet device. Love it, use it everyday! I have used this Bible for years. It is my favorite one to use. I have tried some others, but this one is so intuitive and I can have my notes and highlights on my iPad or phone. I had a glitch a few years back and some frustration with getting a response from support, but eventually I deleted the app and reloaded it. Once I signed back in all my stuff was right there. It is so easy to search whatever word I want to find, and once I got the settings the way I want them, it is just so easy to go anywhere in my Bible. I think this app is great to use, and the versatility in different versions and all that. Plus, you always have your phone, and we always need the Word of God. I prefer paper, but I wanna get fed continually and sometimes I don’t got my tree made Bible. Get it. Its worth it. The bible works just fine in most regards, but i do have a couple of requests: Because I use this in my group bible study, It would be great to be able to save a place, and quickly go back to that scripture after going to another one. That ability to toggle back and forth between previously read scriptures would be so helpful. Also, I'm having some trouble managing the area used to find scriptures; its a bit small for large fingers to manipulate on my ipad. Love the latest update. Love the options of commentary that we can access too. Only reason not 5 stars is I'd like to be able to remove items from my "recently used" that I don't need. Things that I may have downloaded a trial version. Great App at your finger-tips! Handy, extremely convenient when you don't have your sword with you ! Tecarta is a good and useful bible app! Love it. Easy to navigate and take notes. I love this app, it is so user friendly and makes bible reading enjoyable. I like the fact that I can highlight important verses and it syncs well. Can you make it possible to sync, with other devices that have the app as well. Overall I love the app. I also love the fact that it gives verses for the day options. It also has devotionals 🙏🏾🙏🏾. Great app indeed! It's nice to have highlighting and linking passages! This bible app has nice style& honest truth I can't find one better these daz! This is a wonderful tool for reading & study anywhere and anytime. It's format makes it Easy to read. It's availability is consistent. This is my best friend when I have a sleepless night . I love it. You start with just the NKJV, but a ton of other Bible versions are available for purchase. I love the new context Bible they released. I also love that I never run out of margin space for my copious notes! The app has never given me any problems, which means a distraction-free study. Love it! Loaded 3 different bibles and can easily navigate between them or compare two of them side by side. Easy indexing passages and verses. When you purchase your first, be sure you purchase/load each successive version through the original bible "store" or they will not be in the same library for side by side display. Works good on iPad nothing on iPhone. Can use the back button to go to previous verse, can highlight anything u declined for cross references. Always with me. Great search function. I've tried a number of Bible apps, and this is by far my favorite. It's very easy to use, you can highlight portions of verses or the whole thing. There are many ways to mark a verse, jot down notes, etc. Very easy to use during sermons. There are more features, check it out! Outstanding Bible App & so much more!! This is "by far" the best & most intuitive bible app I have ever come across. It's completely robust in its features and content but has the functionality and convenience of an app! This is truly the best! This is even much better than YouVersion! For one thing, it doesn't have advertisements and a silly attempt at an internal social media platform. The powerful offline search function of this app, as well as the cross-reference function makes it the best Bible app I have ever seen. Very intuitive interface! The only problem is, the initial price is a bit scary, but in the end, it's well worth the price. Just think of it as an investment! I love this app. It is the easiest way to navigate the Bible and to take notes. I hope they begin to offer bullets and bold lettering in the note taking though. It would greatly help. I've used several bible apps. Navigation is the major problem most of the time. This app takes the prize in ease of navigation. It is fast, intuitive, and I love it. There may be better, but I have not found it. I've been using this App for awhile and I love it! Very User friendly! Love that I can have all of my Bible translations in one convenient place! Finally a Bible suite that really works and has all the features I've been looking for, and that are extremely easy to access and use. A few more highlight colors for indexing my selections is the only thing I can think of to make it better. This app has been a close companion in my life. I love all of the study tools it comes with. Especially the colored highlights. I began using this for a through-the-Bible-program. I now use it as a ready reference for personal devotional times. I have found it easy to use. I have not used its other features. Great for my purposes. Wow - fraud - something is up. I had about 6 bibles on this app. And for no known reason all of my bibles disappeared out of my account. So I went to log back in to recover my bibles, but I forgot my pass ward, So I clicked on recovery for pass ward, but instead of giving me a temporary pass ward so I could make a new one, I was asked to click on a link. And there they had me give them a new pass ward, after I did that, I was asked for my email pass ward, but by then it was too late, I already gave them my pass ward that has my visa on it etc. I would not recommend this app, do to the fraud. I would like to be able to highlight the text. I love everything else about it. Ive been using this app for yearsand it just dawned on me ive never given a review. This app is amazing! 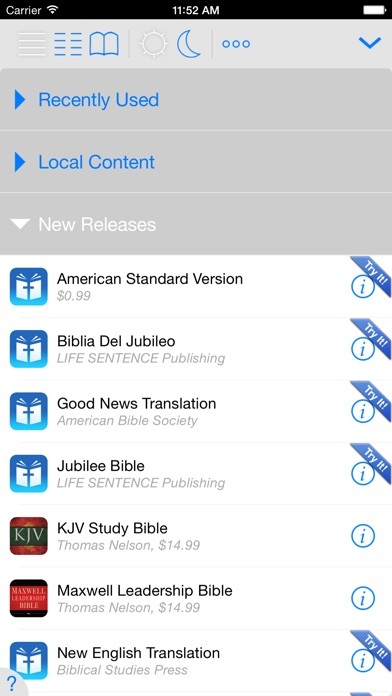 Audio bibles, all the different bible translations, im able to very easily find bible verses. If i want to study on specific words of the bible im able to with the search function. Ive used other bible apps but this one has an ease of use that i dont see the other apps having. I absolutely love this app. Blessings to you developers in Jesus name! You've certainly blessed me.. Great app! I use this New King James Version Bible for my daily devotions. I really love it!! I've always used the King James but I really like the way this new one reads, not washed out like other versions but yet easy to understand. You use to be able to search by phrase now you can’t. Did you change this or do you need to update the app? I have many Bible Apps but this one surpasses them all! Tecarta makes Bible App fun and easy. 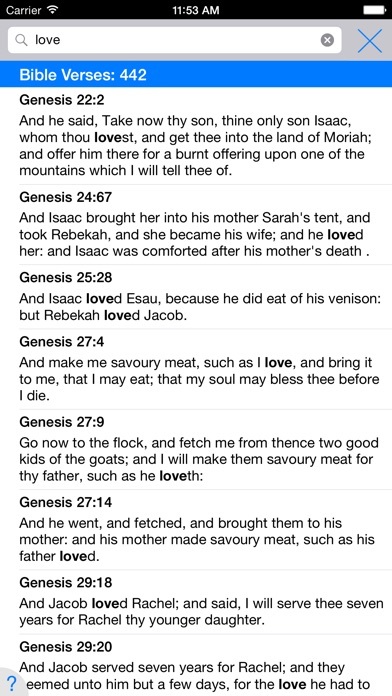 The features are very easy to use more than any other Bible App I know. I only wish they add more colors for highlighting.